Over 67,000 Visitors from 1999 to 9/27/03! 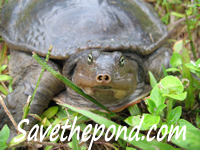 Information on freshwater turtles and outdoor ponds for turtles. In November 2005, I began dividing up these turtle pages from 11 pages in the main directory to 26 pages in their own directory. I moved the pages to their new directory on 2/3/06. Be sure to visit all the pages. 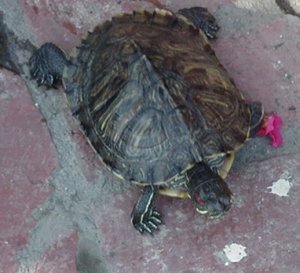 This is a female red-eared slider that appeared at a fellow watergardener's pond in California in January 2001. Turtle FAQ - "I found a turtle; how do I care for it? What is it?" Additives - vitamins, tonics, etc. Turtle pond article by Lori Green, includes many turtle links. This article can now be found at this site as well. Randy's Turtles - photos of painted turtles, a yellow-bellied slider, and red-eared sliders. Also, see my pond pictures page and pond pictures from other people page for some turtle photos. Most should be somewhere on various turtle pages as well. When I moved my site, I tried to contact this ring that follows but the e-mail bounced back so I guess they are defunct. This page used to have a counter at UMBC. The final count from 9/25/00 to 9/27/03 was 54837. The server reset the counter on 9/25/00. The last recorded hits was 12560 on 9/1/00 since June 12, 1999.